I know I've been talking about food lately, and it must be because I actually have a house with a kitchen and all the "regular" appliances, and let me tell you... cooking/baking is much more enjoyable with a dishwasher to help you clean up. One thing I have been struggling with is coming up with a menu for my family of three. I feel like we're eating the same dinners over and over and over again because of my lack of creativity (and lack of funds). Trust me, I've got PLENTY of great recipes I want to try, if it weren't for the "odd ingredients." Anyway, it's because of this dilemma that I'm looking to you, readers and bloggers alike, for help! That's why I'm starting a Friday Favorite Foods linkup! Every Friday, I'm going to post a new recipe I've tried and loved and invite you to share one of your own! Sometimes it'll be just breakfast ideas, sometimes lunch, dinner, and (probably a lot more often) desserts. Why don't we start this off right? Today is just the announcement of the beginning of a new era... or, just announcing that next week is when the linkup will officially start, and I want to start it all off with a recipe I just tried for a delicious Chocolate Italian Love Cake. I've never heard of this before, and you better believe that I found it on Pinterest! Let's begin, shall we? It may take a little time, and I'll admit, not the cheapest dessert around, but this stuff is g-ood, ESPECIALLY on the second day. So start gathering your thoughts, recipes, and ideas and get ready to start linking up with me next week! At the end of each week, I'll gather all the shared recipes and compile them into a Blogger's Favorite Foods recipe book to share with everyone! So if you want it to be good, make sure you share your recipes and get your fellow bloggers to share. Let's make this fun (and tasty)! For next week's linkup, feel free to share any type of recipe you feel so inclined to share, whether it's breakfast, lunch, dinner, dessert, or just a snack. I'll see you there! 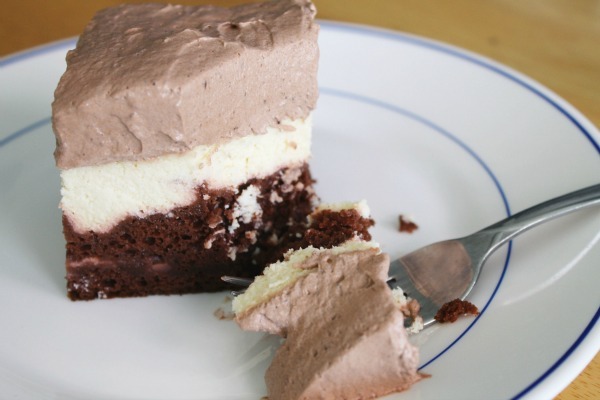 Hi... why does the cheese cake fall to the bottom in all other Chocolate Italian Love Cakes i have seen but not this one? That is a good question... maybe it's because you use ricotta cheese instead of cream cheese and is lighter, or maybe the other ones didn't pour the cheese cake mixture carefully enough so it leaked through to the bottom? I do think the cheese cake leaked through a little into the cake, but not too much. Just pour it in very carefully! Good luck and enjoy!